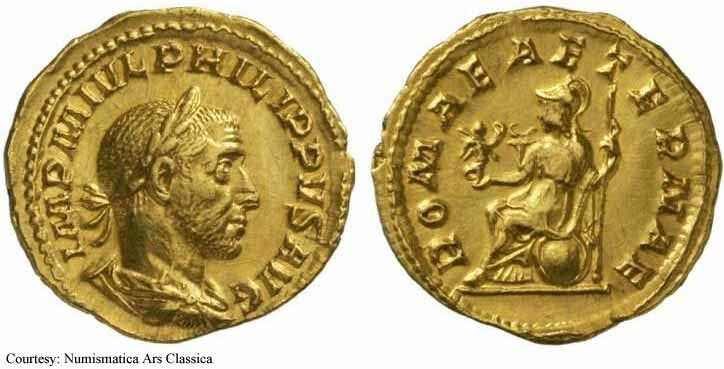 244 - 249 Gordian III was a fairly popular ruler when Philip, a Romanized Arabian, was selected as Praetorian Prefect. This was a highly influential post and one of Philip's duties under Gordian was the control of military supply logistics. Because he was ambitious and longed to be emperor himself he manipulated and purposefully mismanaged the soldiers' food supply in hopes of pinning the blame on the emperor. This worked quite well and the hungry soldiers mutinied and killed Gordian. Before the treasonous conspiracy could be investigated, Philip finished the game plan by proclaiming himself emperor and the Senate went along. Philip turned out to be a successful leader on the battlefield. He negotiated a peace treaty with the Persians and headed back to Rome. When new revolts sprouted along the Danube, he sent off Trajan Decius to take care of them. This was poor judgment on his part because Decius would wind up doing such a good job that his soldiers arbitrarily promoted him to Augustus. 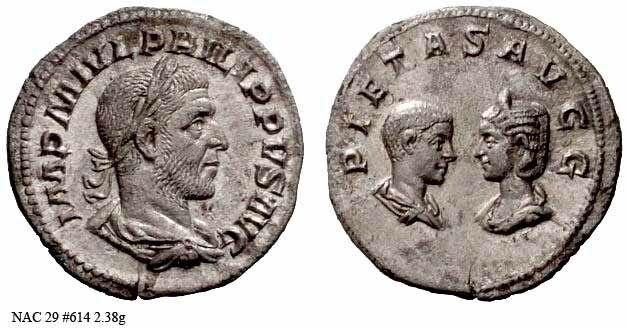 Philip mustered an army to take on Decius but was beaten and killed in the battle. RIC 24a, C 191 Aureus Obv: IMPPHILIPPVSAVG - Laureate, draped and cuirassed bust right. Rev: SAECVLARESAVGG - Cippus reading COS/III. c.248 (Rome). $19,011 12/5/02. 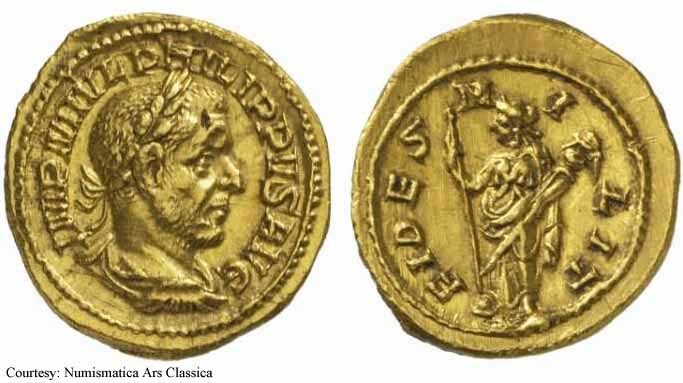 RIC 28a, C 23 Aureus Obv: IMPMIVLPHILLIPVSAVG - Laureate, draped and cuirassed bust right. Rev: ANNONAAVGG - Annona standing left, holding grain ears over modius and cornucopia. 244-247 (Rome). $14,712 2/18/02. 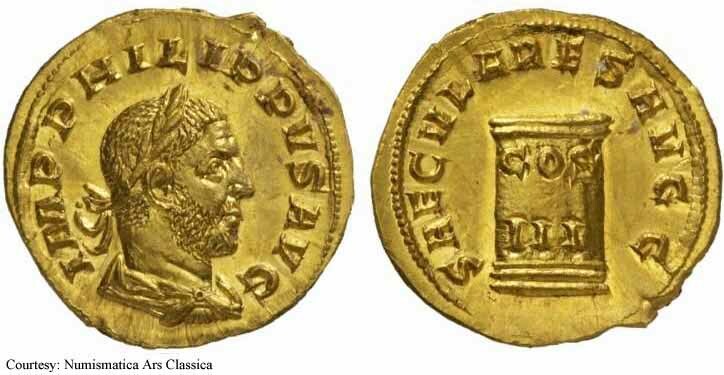 RIC 44a, C 168 Aureus Obv: IMPMIVLPHILIPPVSAVG - Laureate, draped and cuirassed bust right. Rev: ROMAEAETERNAE - Roma seated left, holding Victory and scepter. c.244-247 (Rome). Unlisted Aureus Obv: IMPPHILLIPVSAVG - Laureate, draped and cuirassed bust right. Rev: AEQVITASAVGG - Aequitas standing left, holding scales and cornucopia. $16,000 1/16/02. 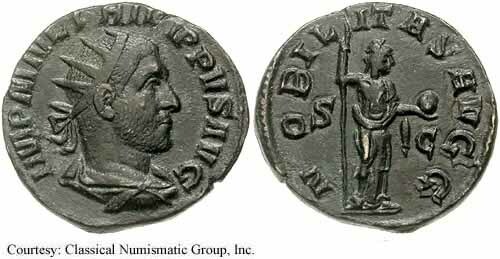 RIC 32a, C 56 Quinarius Obv: IMPMIVLPHILIPPVSAVG - Laureate, draped and cuirassed bust right. Rev: FIDESMILIT - Fides standing left, holding scepter and standard. c.244-247 (Rome). 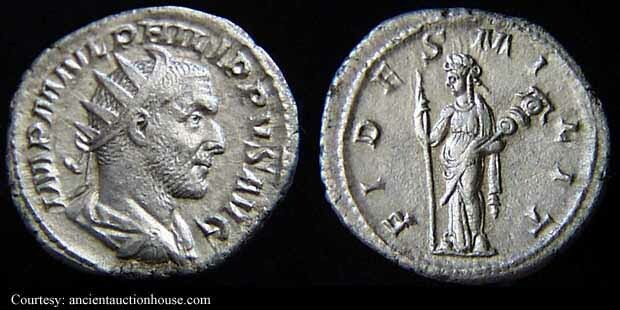 RIC 2b Antoninianus Obv: IMPMIVLPHILIPPVSAVG - Radiate, draped and cuirassed bust right. Rev: PMTRPIICOSPP - Philip seated left, holding globe and scepter. 245 (Rome). 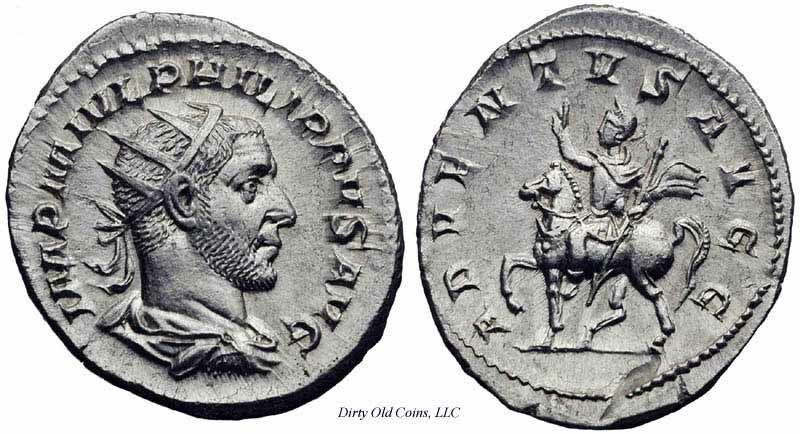 RIC 3, C 124 Antoninianus Obv: IMPMIVLPHILIPPVSAVG - Radiate, draped and cuirassed bust right. Rev: PMTRPIIICOSPP - Felicitas standing left, holding caduceus and cornucopia. 246 (Rome). 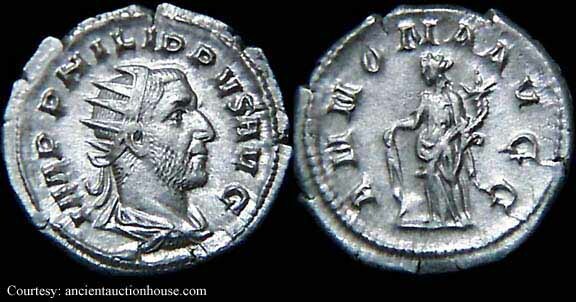 RIC 4, C 136 Antoninianus Obv: IMPMIVLPHILIPPVSAVG - Radiate, draped and cuirassed bust right. Rev: PMTRPIIIICOSIIPP - Felicitas standing left, holding caduceus and cornucopia. 247 (Rome). RIC 5, C 137 Antoninianus Obv: IMPPHILIPPVSAVG - Radiate, draped and cuirassed bust right. RIC 7, C 145 Antoninianus Obv: IMPPHILIPPVSAVG - Radiate, draped and cuirassed bust right. Rev: PMTRPVCOSIIPP - Mars standing left, holding branch and resting hand on shield, 'A' in left field. 248 (Rome). RIC 8, C 98 Antoninianus Obv: IMPPHILIPPVSAVG - Radiate, draped and cuirassed bust right. Rev: NOBILITASAVGG - Nobilitas standing right, holding scepter and globe. $18 9/20/03. RIC 9, C 223 Antoninianus Obv: IMPPHILIPPVSAVG - Radiate, draped and cuirassed bust right. Rev: TRANQVILLITASAVGG - Tranquillitas standing left, holding capricornus and scepter; "B" in left field. RIC 10, C 241 Antoninianus Obv: IMPPHILIPPVSAVG - Radiate, draped and cuirassed bust right. Rev: VIRTVSAVGG - Philip I and II each riding horse right, each raising hand and holding a spear; Оµ in right field. 248 (Rome). RIC 12 Antoninianus Obv: IMPPHILIPPVSAVG - Radiate, draped and cuirassed bust right. Rev: SAECVLARESAVGG Exe: I - Lion advancing right. 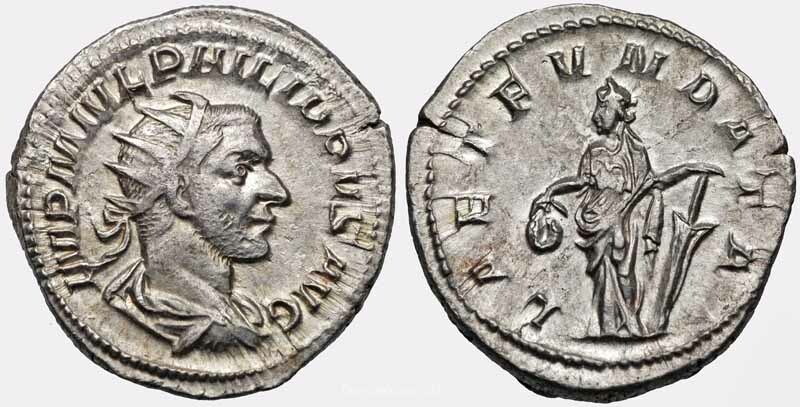 RIC 15, C 178 Antoninianus Obv: IMPPHILIPPVSAVG - Radiate, draped and cuirassed bust right. Rev: SAECVLARESAVGG Exe: II - Wolf standing left, suckling Romulus and Remus. RIC 17, C 186 Antoninianus Obv: IMPPHILIPPVSAVG - Radiate, draped and cuirassed bust right. Rev: SAECVLARESAVGG Exe: III - Antelope advancing left. 248 (Rome). $61 3/4/03. RIC 19, C 182 Antoninianus Obv: IMPPHILIPPVSAVG - Radiate, draped and cuirassed bust right. Rev: SAECVLARESAVGG Exe: U - Deer advancing right. 248 (Rome). $68 6/13/04. RIC 20, C 185 Antoninianus Obv: IMPPHILIPPVSAVG - Radiate, draped and cuirassed bust right. Rev: SAECVLARESAVGG Exe: U - Deer advancing left. 248 (Rome). RIC 21, C 189 Antoninianus Obv: IMPPHILIPPVSAVG - Radiate, draped and cuirassed bust right. Rev: SAECVLARESAVGG Exe: UI - Antelope advancing left. RIC 22, C 188 Antoninianus Obv: IMPPHILIPPVSAVG - Radiate, draped and cuirassed bust right. Rev: SAECVLARESAVGG Exe: VI - Antelope advancing right. 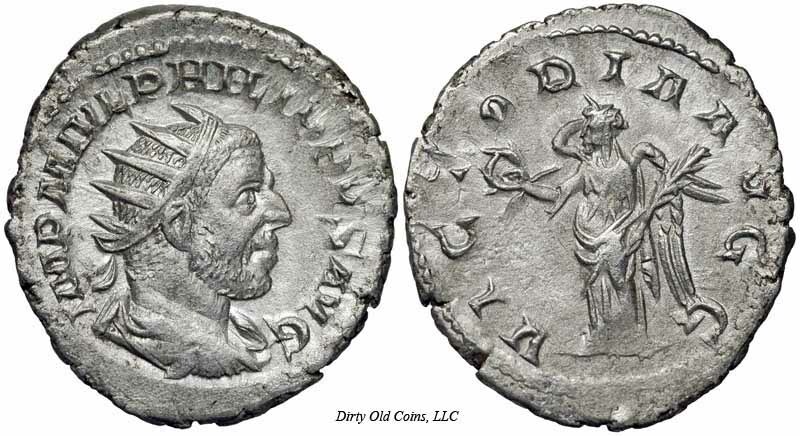 RIC 24c, C 193 Antoninianus Obv: IMPPHILIPPVSAVG - Radiate, draped and cuirassed bust right. Rev: SAECVLARESAVGG - Cippus reading COS/III. 248-249 (Rome). RIC 25b, C 198 Antoninianus Obv: IMPPHILIPPVSAVG - Radiate, draped and cuirassed bust right. Rev: SAECVLVMNOVVM - Temple with six columns; statue within. 248-249 (Rome). RIC 25b(var.) 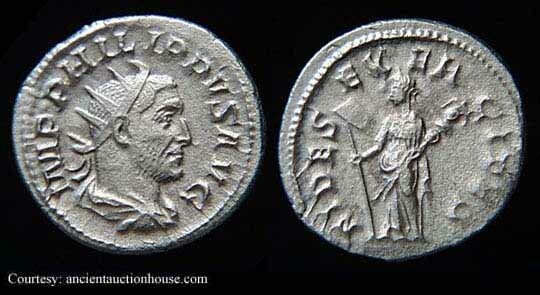 Antoninianus Obv: IMPMIVLPHILIPPVSAVG - Radiate, draped and cuirassed bust right. RIC 26b, C 3 Antoninianus Obv: IMPMIVLPHILIPPVSAVG - Radiate, draped and cuirassed bust right. Rev: ADVENTVSAVGG - Philip riding horse left, raising hand and holding scepter. 245 (Rome). 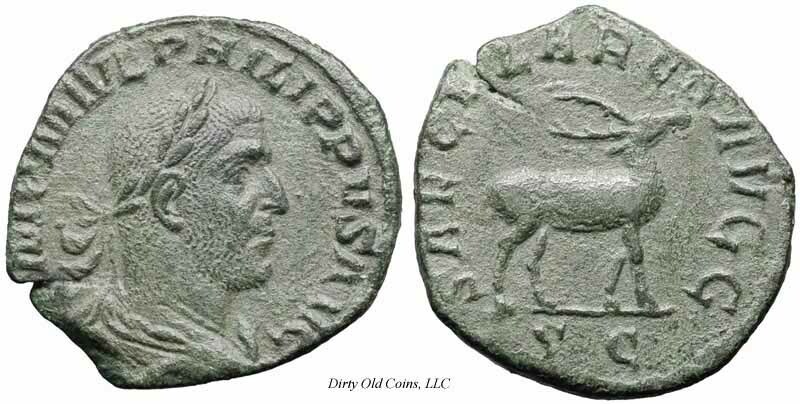 RIC 27b, C 9 Antoninianus Obv: IMPMIVLPHILIPPVSAVG - Radiate, draped and cuirassed bust right. Rev: AEQVITASAVGG - Aequitas standing left, holding scales and cornucopia. 246-247 (Rome). RIC 28c, C 25 Antoninianus Obv: IMPMIVLPHILIPPVSAVG - Radiate, draped and cuirassed bust right. Rev: ANNONAAVGG - Annona standing left, holding grain ears over modius and cornucopia. 246 (Rome). RIC 29, C 32 Antoninianus Obv: IMPMIVLPHILIPPVSAVG - Radiate, draped and cuirassed bust right. Rev: ANNONAAVGG - Annona standing left, holding grain ears over galley prow and cornucopia. 247 (Rome). 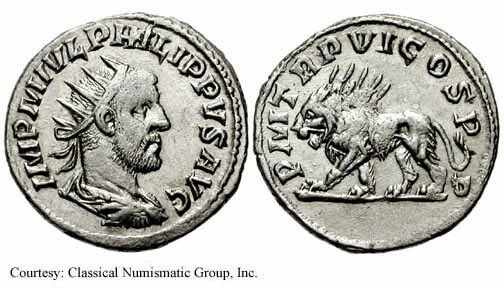 RIC 31, C 43 Antoninianus Obv: IMPMIVLPHILIPPVSAVG - Radiate, draped and cuirassed bust right. Rev: FELICITASTEMP - Felicitas standing left, holding caduceus and cornucopia. 246 (Rome). 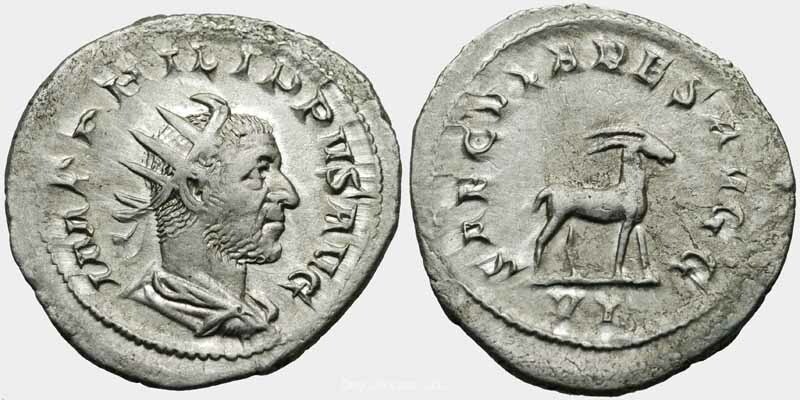 RIC 32b, C 55 Antoninianus Obv: IMPMIVLPHILIPPVSAVG - Radiate, draped and cuirassed bust right. Rev: FIDESMILIT - Fides standing left, holding a standard in each hand. 244 (Rome). 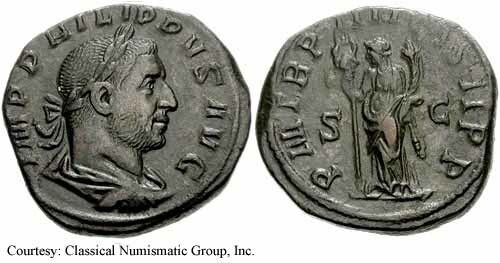 RIC 33b, C 54 Antoninianus Obv: IMPMIVLPHILIPPVSAVG - Radiate, draped and cuirassed bust right. 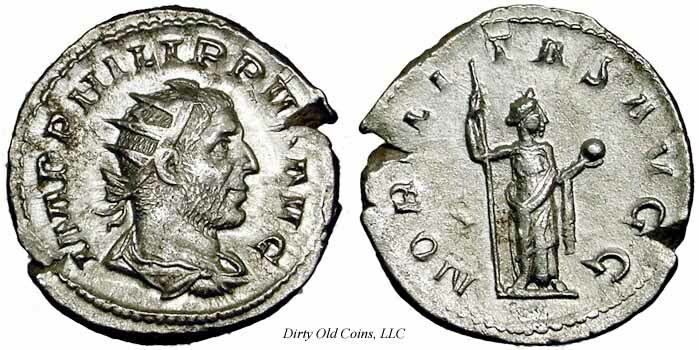 RIC 34b, C 58 Antoninianus Obv: IMPMIVLPHILIPPVSAVG - Radiate, draped and cuirassed bust right. Rev: FIDESMILITVM - Fides standing left, holding a standard in each hand. 245 (Rome). $22 2/28/03. RIC 35b, C 72 Antoninianus Obv: IMPMIVLPHILIPPVSAVG - Radiate, draped and cuirassed bust right. Rev: LAETFVNDATA - Laetitia standing left, holding wreath and rudder. RIC 35b(var.) 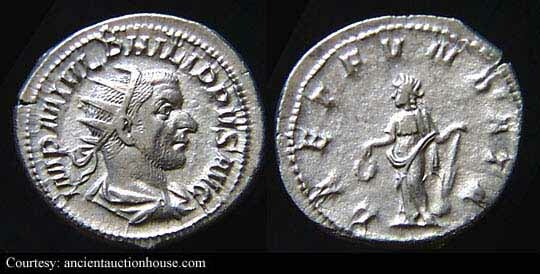 Antoninianus Obv: IMPMIVLPHILIPPVSAVG - Radiate, draped and cuirassed bust right. Rev: LAETFVNDATA - Laetitia standing left, holding wreath and rudder on globe. RIC 38b, C 87 Antoninianus Obv: IMPMIVLPHILIPPVSAVG - Radiate, draped and cuirassed bust right. Rev: LIBERALITASAVGGII - Liberalitas standing left, holding coin counter and cornucopia. 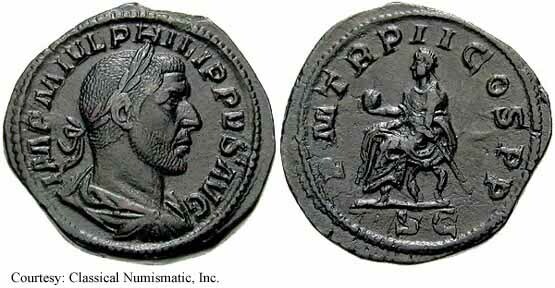 RIC 40b, C 103 Antoninianus Obv: IMPMIVLPHILIPPVSAVG - Radiate, draped and cuirassed bust right. Rev: PAXAETERN - Pax standing left, holding branch and scepter. 244 (Rome). 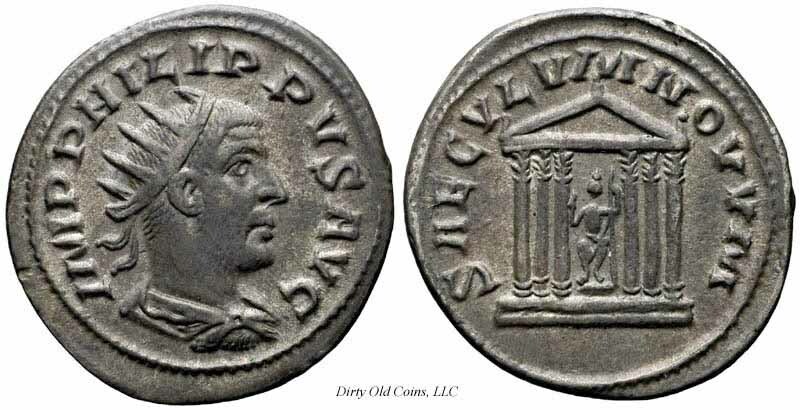 RIC 41, C 102 Antoninianus Obv: IMPMIVLPHILIPPVSAVG - Radiate, draped and cuirassed bust right. Rev: PAXAETERN - Pax advancing left, holding branch and scepter. 244 (Rome). 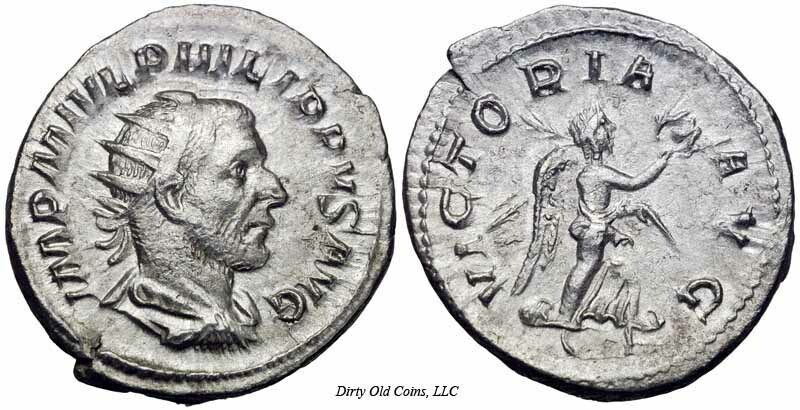 RIC 43a, C 5 Antoninianus Obv: IMPMIVLPHILIPPVSAVG - Radiate, draped and cuirassed bust right. Rev: PIETASAVGG - Philip II bare headed, draped bust right facing Otacilia Severa diademed, draped bust left. 247 (Rome). 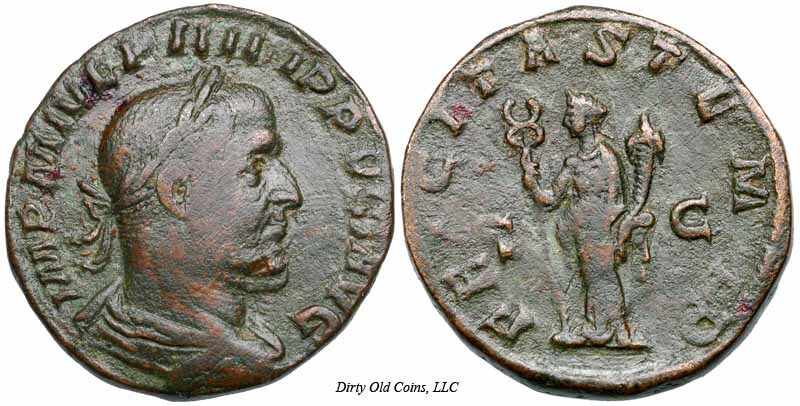 RIC 44b, C 169 Antoninianus Obv: IMPMIVLPHILIPPVSAVG - Radiate, draped and cuirassed bust right. Rev: ROMAEAETERNAE - Roma seated left, holding Victory and scepter. 247 (Rome). $23 10/4/03. 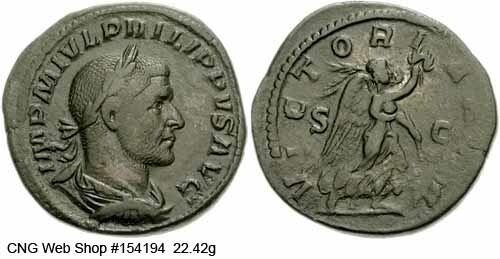 RIC 45, C 170 Antoninianus Obv: IMPMIVLPHILIPPVSAVG - Radiate, draped and cuirassed bust right. Rev: ROMAEAETERNAE - Roma seated left, holding Victory and scepter; altar to left. 247 (Rome). 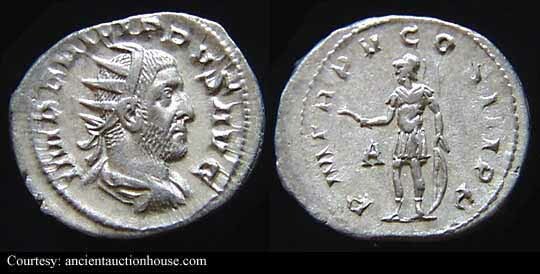 RIC 46b, C 209 Antoninianus Obv: IMPMIVLPHILIPPVSAVG - Radiate, draped and cuirassed bust right. Rev: SALVSAVG - Salus standing right, holding and feeding snake. RIC 47b, C 205 Antoninianus Obv: IMPMIVLPHILIPPVSAVG - Radiate, draped and cuirassed bust right. Rev: SALVSAVG - Salus standing left, feeding snake on altar and holding rudder. RIC 48b, C 215 Antoninianus Obv: IMPMIVLPHILIPPVSAVG - Radiate, draped and cuirassed bust right. Rev: SECVRITORBIS - Securitas seated left, holding scepter and resting head on hand. 245 (Rome). 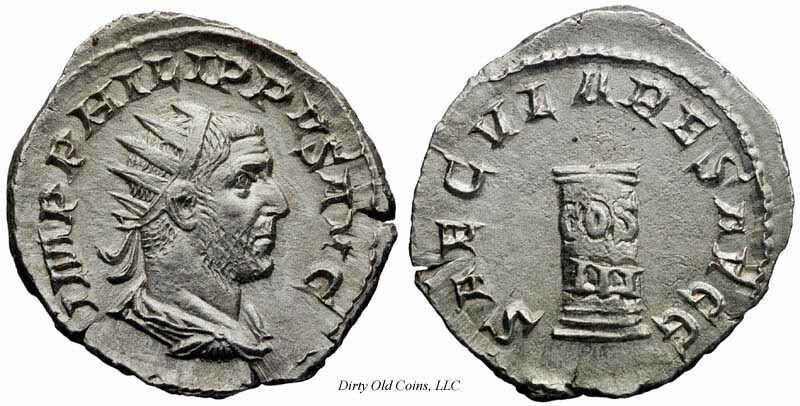 RIC 49b, C 227 Antoninianus Obv: IMPMIVLPHILIPPVSAVG - Radiate, draped and cuirassed bust right. Rev: VICTORIAAVGG - Victory advancing right, holding wreath and palm. 244 (Rome). RIC 50, C 231 Antoninianus Obv: IMPMIVLPHILIPPVSAVG - Radiate, draped and cuirassed bust right. Rev: VICTORIAAVGG - Victory advancing left, holding wreath and palm. 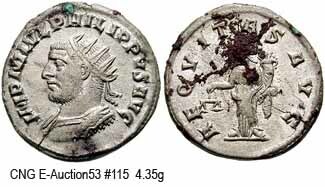 RIC 51, C 235 Antoninianus Obv: IMPMIVLPHILIPPVSAVG - Radiate, draped and cuirassed bust right. Rev: VICTORIAAVGG - Victory standing left, holding wreath and palm. 244 (Rome). 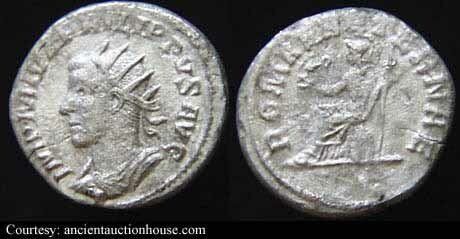 RIC 52, C 239 Antoninianus Obv: IMPMIVLPHILIPPVSAVG - Radiate, draped and cuirassed bust right. Rev: VIRTVSAVG - Virtus standing left, stepping on helmet, holding branch and spear. 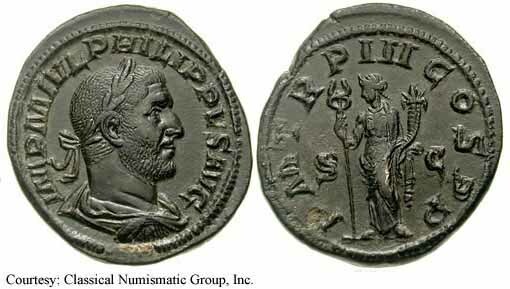 RIC 53, C 240 Antoninianus Obv: IMPMIVLPHILIPPVSAVG - Radiate, draped and cuirassed bust right. Rev: VIRTVSAVG - Virtus seated left, holding branch and spear. 244 (Rome). RIC 57, C 12 Antoninianus Obv: IMPPHILIPPVSAVG - Radiate, draped and cuirassed bust right. Rev: AEQVITASAVGG - Aequitas standing left, holding scales and cornucopia. 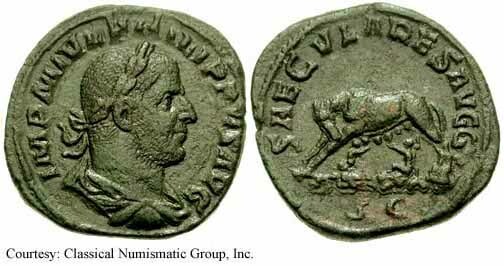 RIC 58, Hunter 31, C 17 Antoninianus Obv: IMPPHILIPPVSAVG - Radiate, draped and cuirassed bust right. Rev: AETERNITASAVGG - Elephant advancing left, driver holding goad and wand. 247-249 (Rome). RIC 59, C 33 Antoninianus Obv: IMPPHILIPPVSAVG - Radiate, draped and cuirassed bust right. Rev: ANNONAAVGG - Annona standing left, holding grain ears over modius and cornucopia. 247 (Rome). $21 11/21/01. RIC 60, C 39 Antoninianus Obv: IMPPHILIPPVSAVG - Radiate, draped and cuirassed bust right. Rev: No legend - Wreath, FELI/CITAS/IMPP within. 249 (Rome). $272 12/30/04. RIC 61, C 49 Antoninianus Obv: IMPPHILIPPVSAVG - Radiate, draped and cuirassed bust right. Rev: FIDESEXERCITVS - Fides standing left, holding vexillum and standard. 249 (Rome). $15 1/5/03. RIC 62, C 50 Antoninianus Obv: IMPPHILIPPVSAVG - Radiate, draped and cuirassed bust right. Rev: FIDESEXERCITVS - Four standards, the third from right has an eagle atop it. $56 11/18/01. 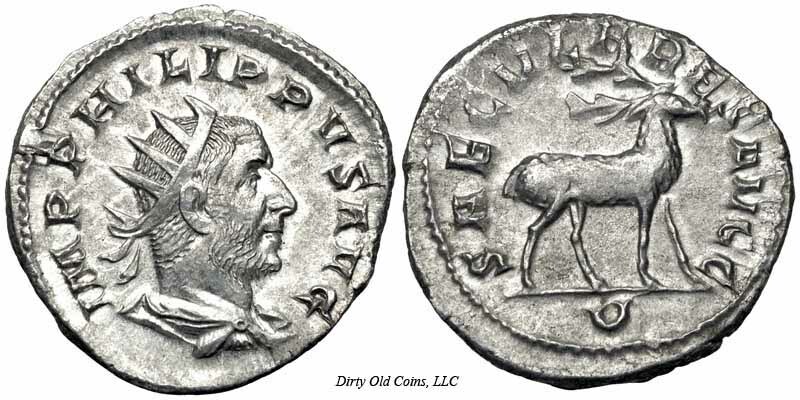 RIC 63b, C 65 Antoninianus Obv: IMPPHILIPPVSAVG - Radiate, draped and cuirassed bust right. Rev: FORTVNAREDVX - Fortuna seated left, holding rudder and cornucopia; wheel under chair. 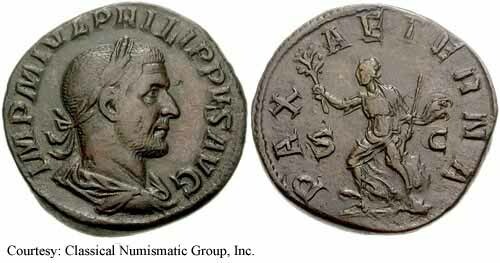 RIC 65, C 171 Antoninianus Obv: IMPPHILIPPVSAVG - Radiate, draped and cuirassed bust right. 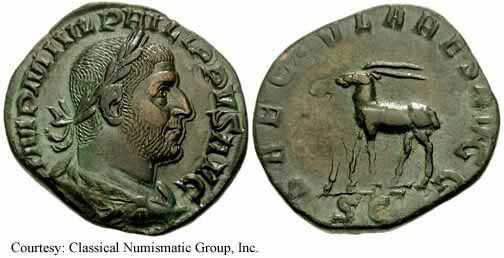 RIC 69, Hunter 120, C 113 Antoninianus Obv: IMPCMIVLPHILIPPVSPFAVGPM - Radiate, draped and cuirassed bust right. Rev: PAXFVNDATACVMPERSIS - Pax standing left, holding branch and scepter. 247 (Antioch). 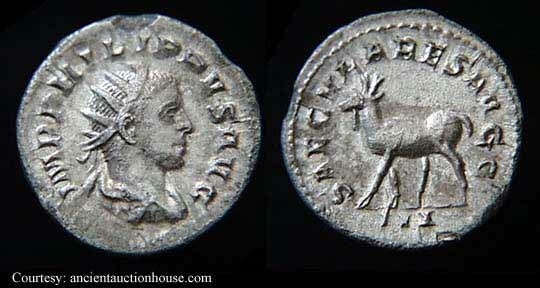 RIC 70, C 221 Antoninianus Obv: IMPCMIVLPHILIPPVSPFAVGPM - Radiate, draped and cuirassed bust right. Rev: SPESFELICITATISORBIS - Spes standing left, holding flower and raising skirt. 244 (Antioch). 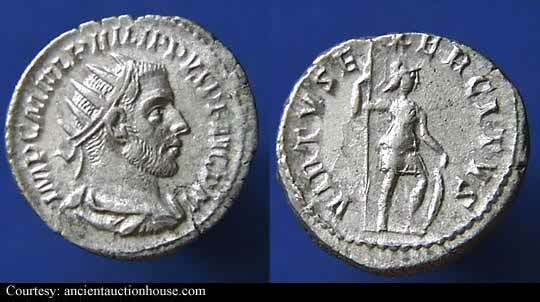 RIC 71, C 243 Antoninianus Obv: IMPCMIVLPHILIPPVSPFAVGPM - Radiate, draped and cuirassed bust right. 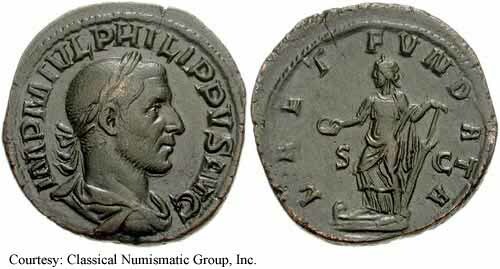 RIC 73, C 220 Antoninianus Obv: IMPMIVLPHILIPPVSPFAVG Exe: PM - Radiate, draped and cuirassed bust right. Rev: SPESFELICITATISORBIS - Spes standing left, holding flower and raising skirt. 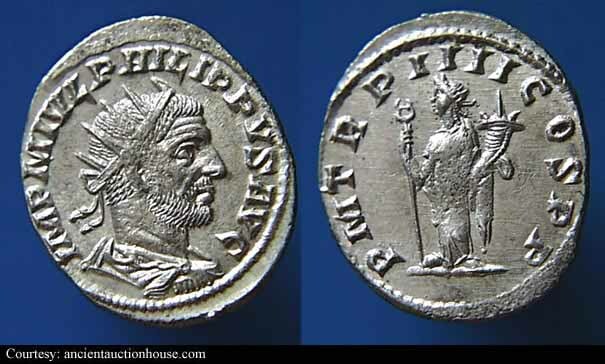 RIC 74, C 245 Antoninianus Obv: IMPMIVLPHILIPPVSPFAVG Exe: PM - Radiate, draped and cuirassed bust right. Rev: VIRTVSEXERCITVS - Virtus standing right, holding spear and resting hand on shield. 244 (Antioch). $159 11/27/02. 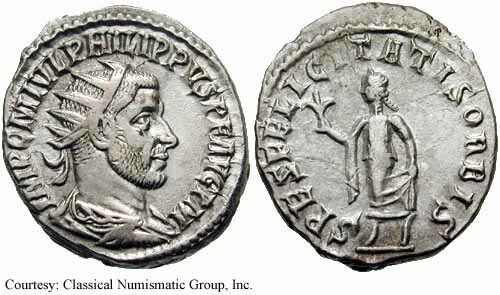 RIC 75a, C 130 Antoninianus Obv: IMPMIVLPHILIPPVSAVG - Radiate, draped and cuirassed bust right. Rev: PMTRPIIIICOSPP - Felicitas standing left, holding caduceus and cornucopia. 247 (Antioch). $48 6/6/03. 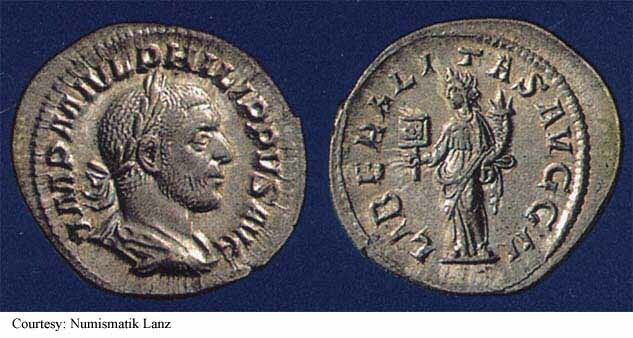 RIC 76, C 135 Antoninianus Obv: IMPMIVLPHILIPPVSAVG - Radiate, cuirassed bust left. Rev: PMTRPIIIICOSIIPP - Felicitas standing left, holding caduceus and cornucopia. 247 (Antioch). 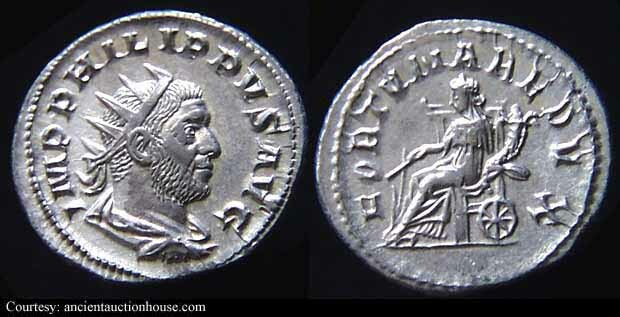 RIC 78, C 155 Antoninianus Obv: IMPMIVLPHILIPPVSAVG - Radiate, draped and cuirassed bust right. Rev: PMTRPVICOSPP - Felicitas standing left, holding caduceus and cornucopia. 249 (Antioch). 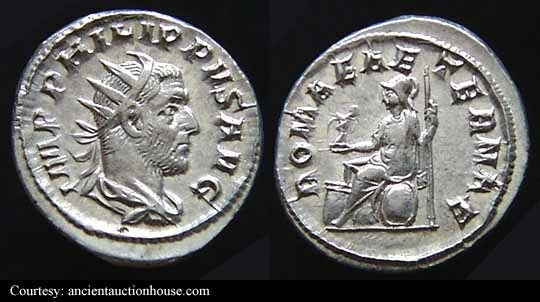 RIC 79a, C 156 Antoninianus Obv: IMPMIVLPHILIPPVSAVG - Radiate, draped and cuirassed bust right. 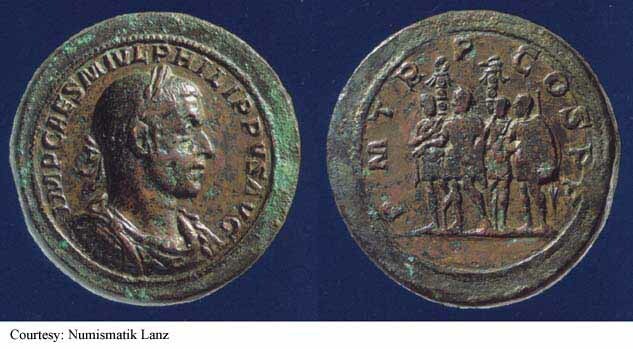 Rev: PMTRPVICOSPP - Philip I standing left, sacrificing over altar and holding scepter. 249 (Antioch). 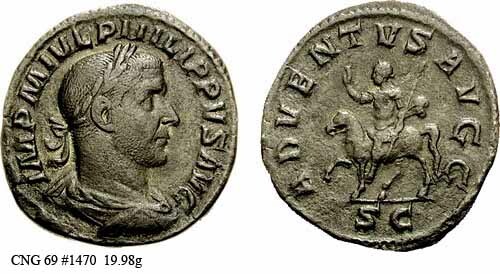 RIC 81, C 4 Antoninianus Obv: IMPMIVLPHILIPPVSAVG - Radiate, draped and cuirassed bust right. Rev: ADVENTVSAVGG - Philip riding horse left, raising hand and holding scepter. 244 (Antioch). $128 6/24/03. 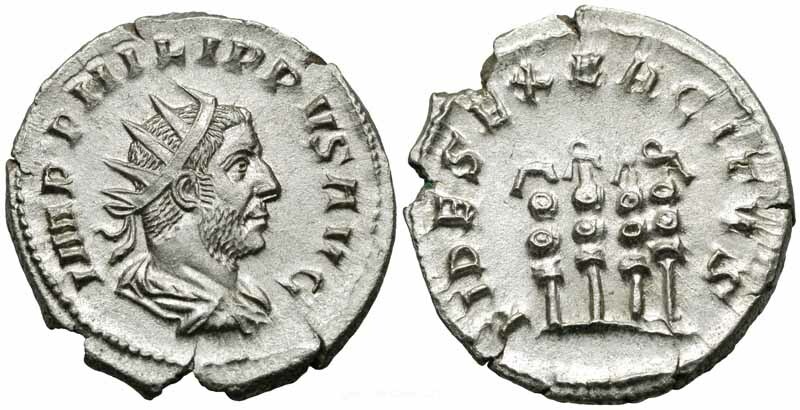 RIC 80v Antoninianus Obv: IMPMIVLPHILIPPVSAVG - Radiate, draped and cuirassed bust right. Rev: PMTRPVICOSPP - Lion, radiate, advancing left. 249 (Antioch). $320 9/24/03. 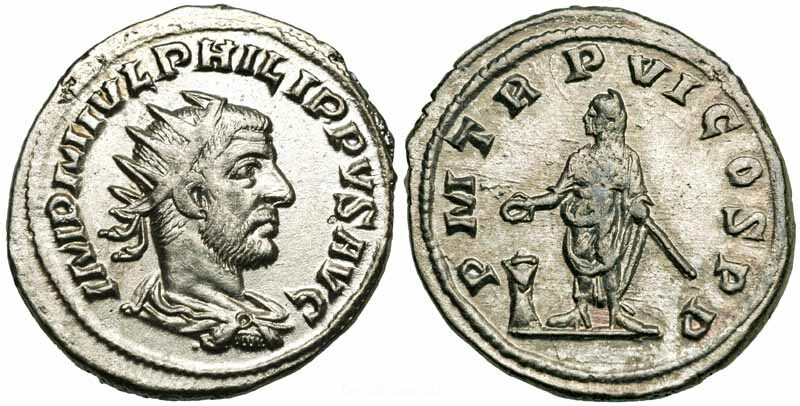 RIC 82v Antoninianus Obv: IMPMIVLPHILIPPVSAVG - Radiate, cuirassed bust left. Rev: AEQVITASAVG - Aequitas standing left, holding scales and cornucopia. 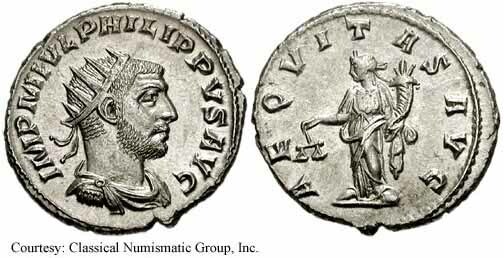 RIC 82v Antoninianus Obv: IMPMIVLPHILIPPVSAVG - Radiate, draped and cuirassed bust right. 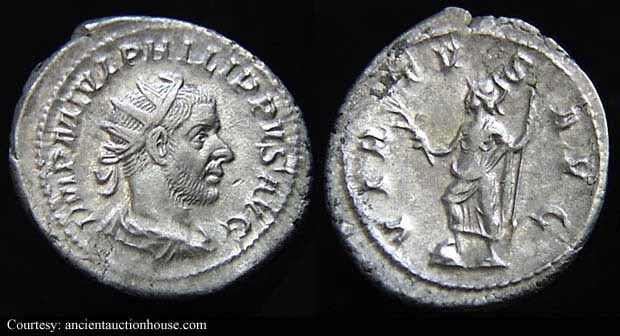 RIC 83 Antoninianus Obv: IMPMIVLPHILIPPVSAVG - Radiate, cuirassed bust left. Rev: CONCORDIAAVGG - Concordia seated left, holding wreath and cornucopia. (Antioch). 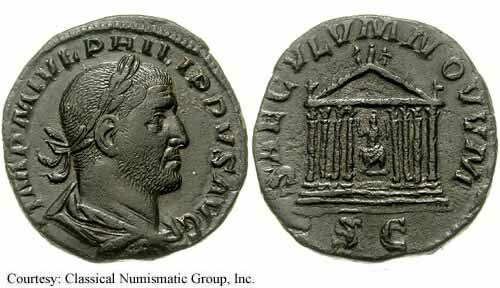 RIC 83v Antoninianus Obv: IMPMIVLPHILIPPVSAVG - Radiate, draped and cuirassed bust right. Rev: CONCORDIAAVGG - Concordia seated left, holding wreath and cornucopia. [RIC unlisted bust type for this series]. (Antioch). 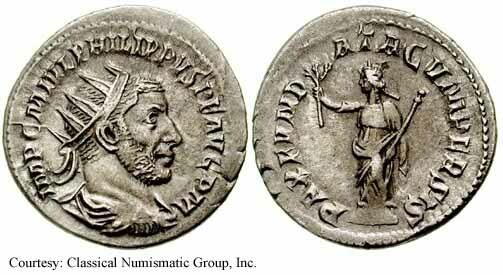 RIC 84, C 41 Antoninianus Obv: IMPPHILIPPVSAVG - Radiate, draped and cuirassed bust left. Rev: No legend - Wreath, FELI/CITAS/IMPP within. RIC 84a Antoninianus Obv: IMPPHILIPPVSAVG - Radiate, draped and cuirassed bust right. Rev: FIDESEXERCITVS - Four standards. 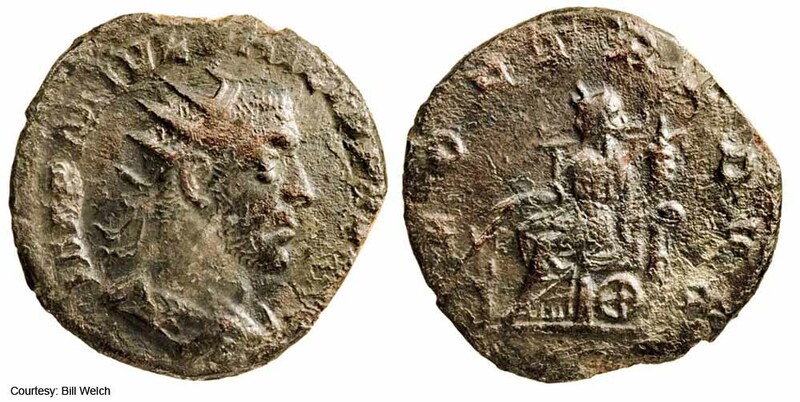 RIC 85, C 167 Antoninianus Obv: IMPMIVLPHILIPPVSAVG - Radiate bust left, draped and cuirassed. Rev: ROMAEAETERNAE - Roma seated left, holding Victory and scepter. 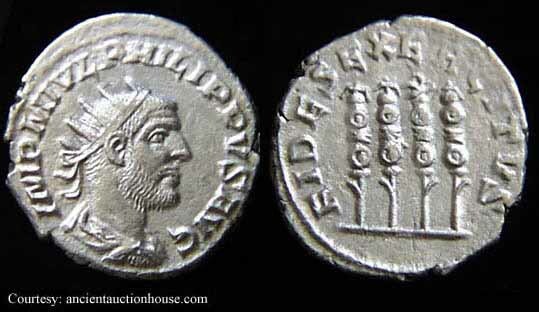 Unlisted Antoninianus Obv: IMPMIVLPHILIPPVSAVG - Radiate, draped bust right. Rev: FORTREDVX - Fortuna seated left, holding rudder and cornucopia; wheel under chair. RIC 43a(var. 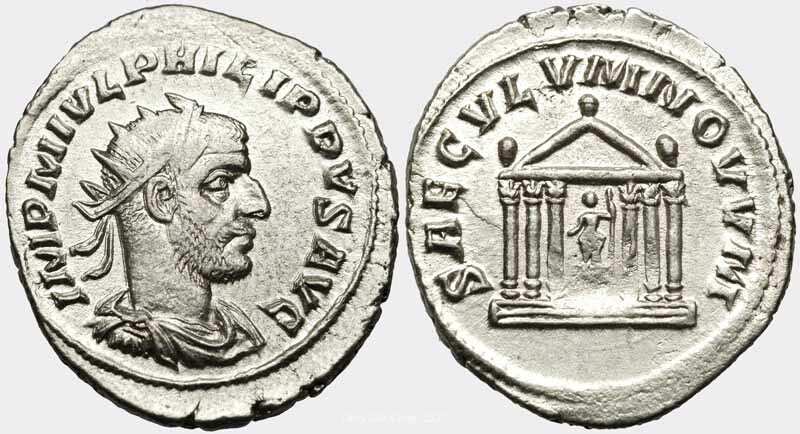 ), C 5 Denarius Obv: IMPMIVLPHILIPPVSAVG - Laureate, draped and cuirassed bust right. 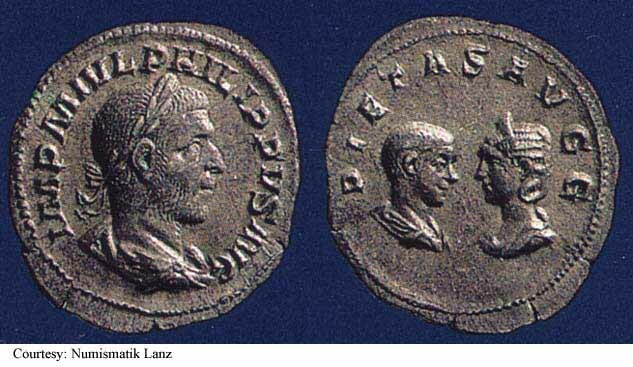 Rev: PIETASAVGG - Busts of Phillip II and Otacilia Severa facing each other. $4,985 11/20/00. 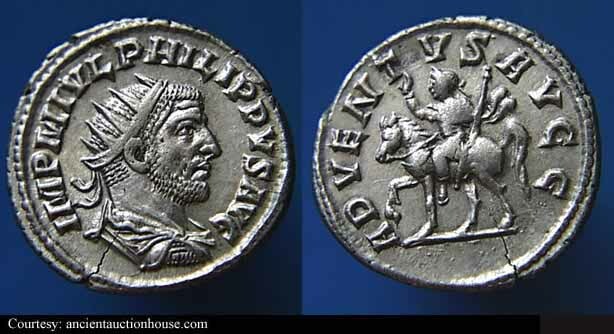 Unlisted Denarius Obv: IMPMIVLPHILIPPVSAVG - Laureate, draped and cuirassed bust right. Rev: LIBERALITASAVGGII - Liberalitas standing left, holding coin counter and cornucopia. $4,118 11/20/00. 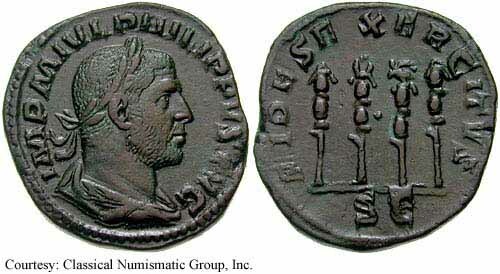 Unlisted RIC, C 115, Gnecchi 4 Bronze Medallion Obv: IMPCAESMIVLPHILIPPVSAVG - Laureate, draped and cuirassed bust right. Rev: PMTRPCOSPP - Emperor among soldiers with two standards behind them. $3,685 11/20/00. RIC 148a, C 121 Sestertius Obv: IMPMIVLPHILIPPVSAVG - Laureate, draped and cuirassed bust right. Rev: PMTRPIICOSPP Exe: SC - Philip I seated left, holding globe and scepter. 245 (Rome). RIC 149a, C 123 Sestertius Obv: IMPMIVLPHILIPPVSAVG - Laureate, draped bust right. Rev: PMTRPIIICOSPP - Felicitas standing left, holding caduceus and cornucopia; S C across fields. 246 (Rome). 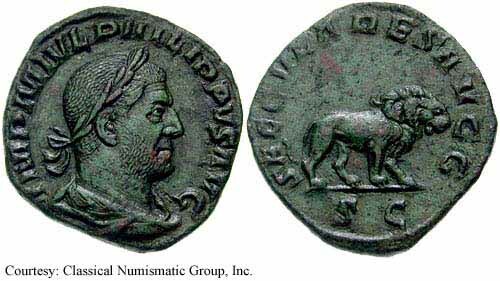 RIC 150c, Hunter 58, C 140 Sestertius Obv: IMPPHILIPPVSAVG - Laureate, draped and cuirassed bust right. Rev: PMTRPIIIICOSIIPP - Felicitas standing left, holding caduceus and cornucopia; S C across fields. 247 (Rome). 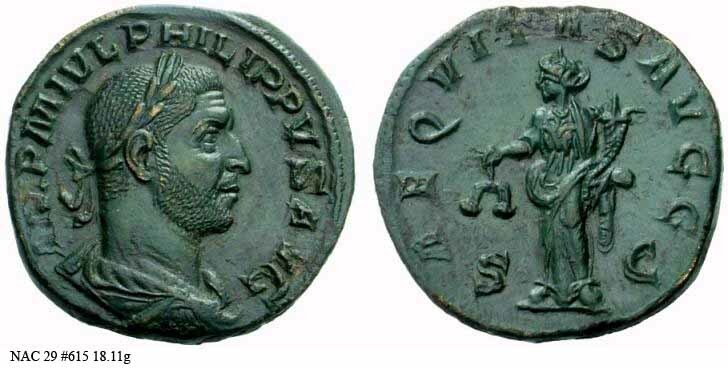 RIC 150v Sestertius Obv: IMPCAESMIVLPHILIPPVSAVG - Laureate, draped bust right. Rev: PMTRPIIIICOSPP - Felicitas standing left, holding caduceus and cornucopia. [See RIC 149a anecdotal for same obv. legend but with rev. legend PM TR P III COS PP]. 247 (Rome). RIC 154a, C 151 Sestertius Obv: IMPPHILIPPVSAVG - Laureate, draped and cuirassed bust right. Rev: PMTRPVCOSIIPP - Philip I seated left, holding globe and scepter; S C across fields. 248 (Rome). RIC 153a, C 149 Sestertius Obv: IMPMIVLPHILIPPVSAVG - Laureate, draped and cuirassed bust right. Rev: PMTRPVCOSIIPP - Felicitas standing left, holding caduceus and cornucopia; S C across fields. 248 (Rome). RIC 157a, C 95 Sestertius Obv: IMPMIVLPHILIPPVSAVG - Laureate, draped and cuirassed bust right. Rev: MILIARVMSAECVLVM - Cippus reading COS/III. 248 (Rome). RIC 158, C 176 Sestertius Obv: IMPMIVLPHILIPPVSAVG - Laureate, draped and cuirassed bust right. Rev: SAECVLARESAVGG Exe: SC - Lion advancing right. 248 (Rome). 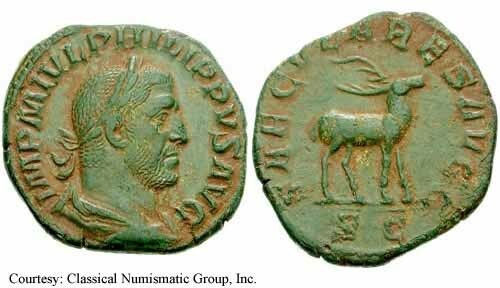 RIC 159, Hunter 106, C 248 Sestertius Obv: IMPMIVLPHILIPPVSAVG - Laureate, draped and cuirassed bust right. Rev: SAECVLARESAVGG Exe: SC - Wolf standing left, suckling Romulus and Remus. 248 (Rome). $495 1/31/04. RIC 160a, C 183 Sestertius Obv: IMPMIVLPHILIPPVSAVG - Laureate, draped and cuirassed bust right. Rev: SAECVLARESAVGG Exe: SC - Deer advancing right. 248 (Rome). RIC 161, Hunter 108, C 190 Sestertius Obv: IMPMIVLPHILIPPVSAVG - Laureate, draped and cuirassed bust right. Rev: SAECVLARESAVGG Exe: SC - Antelope standing left. 248 (Rome). RIC 164, C 201 Sestertius Obv: IMPMIVLPHILIPPVSAVG - Laureate, draped and cuirassed bust right. Rev: SAECVLVMNOVVM Exe: SC - Temple with eight columns, Roma within. 248 (Rome). $350 5/21/03. 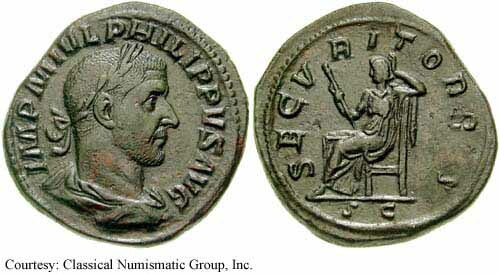 RIC 165v Sestertius Obv: IMPMIVLPHILIPPVSAVG - Laureate, draped and cuirassed bust right. Rev: ADVENTVSAVGG Exe: SC - Philip I riding horse left, raising hand and holding scepter. 248 (Rome). RIC 166a, C 10 Sestertius Obv: IMPMIVLPHILIPPVSAVG - Laureate, draped and cuirassed bust right. Rev: AEQVITASAVGG - Aequitas standing left, holding scales and cornucopia. 247-249 (Rome). RIC 167a Sestertius Obv: IMPMIVLPHILIPPVSAVG - Laureate, draped and cuirassed bust right. Rev: AETERNITASAVGG Exe: SC - Elephant with rider advancing left. RIC 168a, C 26 Sestertius Obv: IMPMIVLPHILIPPVSAVG - Laureate, draped and cuirassed bust right. Rev: ANNONAAVGG - Annona standing left, holding corn ears over modius and cornucopia; S C across fields. 244-249 (Rome). RIC 169a, C 44 Sestertius Obv: IMPMIVLPHILIPPVSAVG - Laureate, draped and cuirassed bust right. Rev: FELICITASTEMP - Felicitas standing left, holding caduceus and cornucopia; S C across fields. 244-249 (Rome). 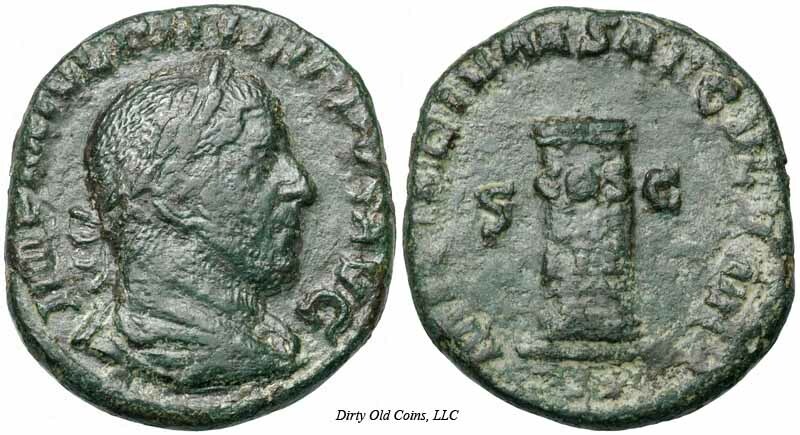 RIC 171a, C 51 Sestertius Obv: IMPMIVLPHILIPPVSAVG - Laureate, draped and cuirassed bust right. Rev: FIDESEXERCITVS Exe: SC - Four standards. 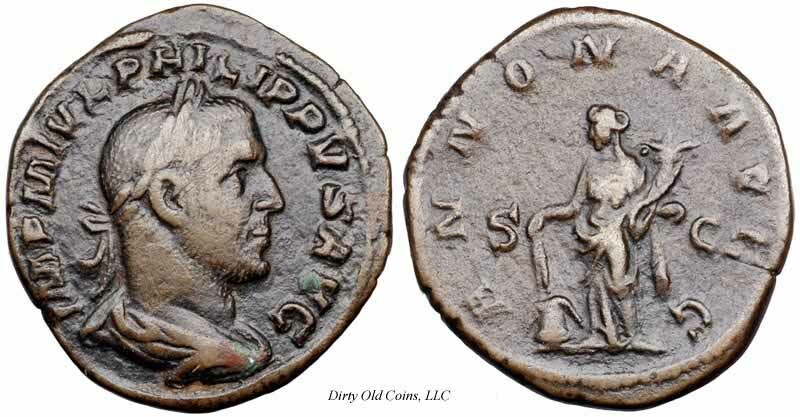 RIC 172a, C 59 Sestertius Obv: IMPMIVLPHILIPPVSAVG - Laureate, draped and cuirassed bust right. Rev: FIDESMILITVM - Fides standing, facing, holding standard in each hand. RIC 174a, C 67 Sestertius Obv: IMPMIVLPHILIPPVSAVG - Laureate, draped and cuirassed bust right. Rev: FORTVNAREDVX Exe: SC - Fortuna seated left, holding rudder and cornucopia; wheel under chair. RIC 176a, C 76 Sestertius Obv: IMPMIVLPHILIPPVSAVG - Laureate, draped and cuirassed bust right. Rev: LAETFVNDATA - Laetitia standing left, stepping on galley prow, holding patera and rudder. 244-249 (Rome). RIC 180a, C 88 Sestertius Obv: IMPMIVLPHILIPPVSAVG - Laureate, draped and cuirassed bust right. Rev: LIBERALITASAVGG - Liberalitas standing left, holding coin counter and cornucopia. 244-249 (Rome). RIC 180a, C 88 Sestertius Obv: IMPCAESMIVLPHILIPPVSAVG - Laureate, draped and cuirassed bust left. Rev: LIBERALITASAVGG - Liberalitas standing left, holding coin counter and cornucopia; S C across fields. 244-249 (Rome). 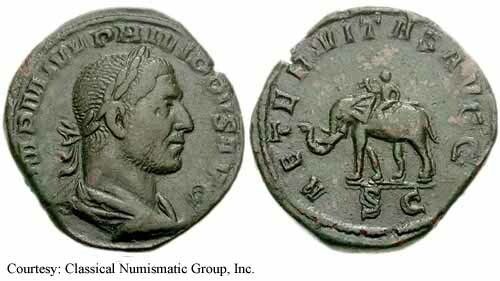 RIC 184a, Hunter 71, C 105 Sestertius Obv: IMPMIVLPHILIPPVSAVG - Laureate, draped and cuirassed bust right. Rev: PAXAETERNA - Pax advancing left, holding branch and scepter. 244-249 (Rome). RIC 187a, C 206 Sestertius Obv: IMPMIVLPHILIPPVSAVG - Laureate, draped and cuirassed bust right. Rev: SALVSAVG - Salus standing left, feeding snake on altar and holding scepter. 244-247 (Rome). 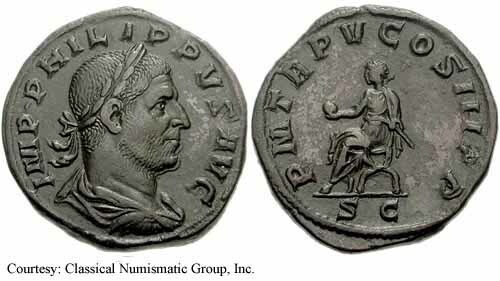 RIC 190, Hunter 78, C 216 Sestertius Obv: IMPMIVLPHILIPPVSAVG - Laureate, draped and cuirassed bust right. Rev: SECVRITORBIS Exe: SC - Securitas seated left, holding scepter. 244-247 (Rome). RIC 191a, C 228 Sestertius Obv: IMPMIVLPHILIPPVSAVG - Laureate, draped and cuirassed bust right. Rev: VICTORIAAVG - Victory advancing right, holding wreath and palm. 244-247 (Rome). $165 7/2/05. 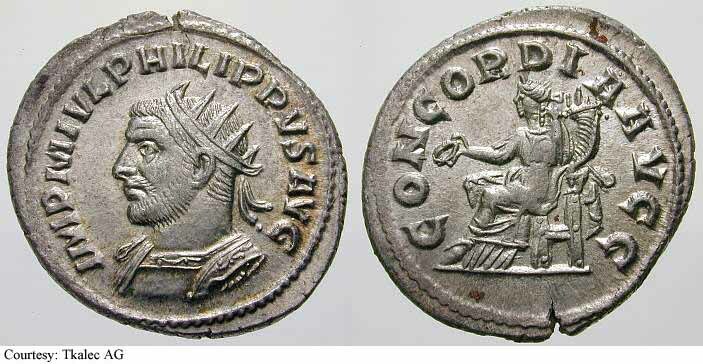 RIC 155 Dupondius Obv: IMPMIVLPHILIPPVSAVG - Laureate, draped and cuirassed bust right. Rev: NOBILITASAVGG - Nobilitas standing right, holding scepter and globe; SC across fields. $500 5/12/03. 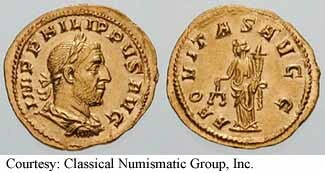 Unlisted Dupondius Obv: IMPMIVLPHILIPPVSAVG - Radiate, draped and cuirassed bust right. RIC 160b, C 184 As Obv: IMPMIVLPHILIPPVSAVG - Laureate, draped and cuirassed bust right. RIC 166b, C 11 As Obv: IMPMIVLPHILIPPVSAVG - Laureate, draped and cuirassed bust right.